It's hard to lie about numbers and charts. Data journalism, which brings stories to life by showing facts in a visual way, is a key in the fight against fake news. Working with news sites and publishers, Google is bringing that information front and center to consumers in its Search results. 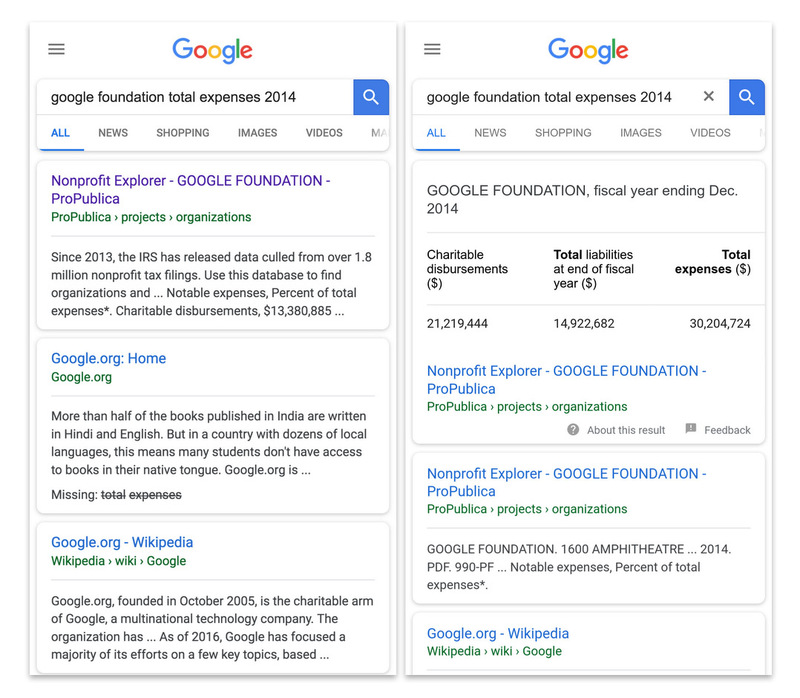 Now, when you Google specific subjects like a non-profit's expenses for a given year, it'll show specific tabular data right at the top of the page ahead all other results. The Search project is an extension of the Google News Initiative, launched earlier this to help fight fake news. To get charts and data into search results, news organizations just need to add certain types of "structured data" to their existing online databases. That way, Google's algorithms can find the info, and publishers can control how it will be shown to readers. So far, Google has been working with sites like ProPublica, which loaned its interactive Nonprofit Explorer database to the project. News sites are creating a lot of data around stories these days, as many have dedicated "data journalists" on staff. A great example of that is a recent story the LA Times did on Kobe Bryant, showing every shot he ever took in his two decade career with the Lakers. When on used for subjects like gerrymandering and global warming, it can make an otherwise dry read a lot more enlightening. The project is currently in the pilot phase, so you may not see it live just yet.